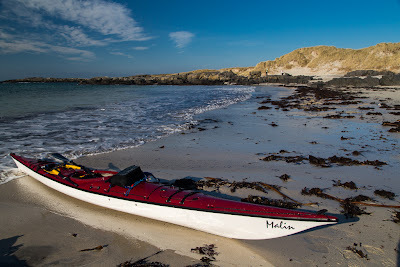 Malin Gometra sea kayak long term test and comparative review. 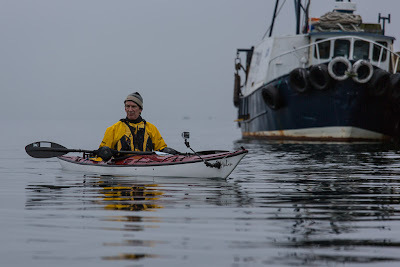 There are so many great articles in Ocean Paddler magazine #38 that there was no room for the comparative performance table from the Malin Gometra sea kayak test. For those that thought one paragraph on the Gometra's performance was a bit short for an OP long term test, I attach the full table below. This test took place during the period February until May 2013. 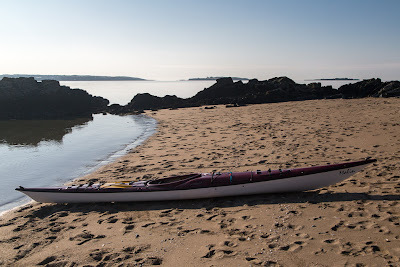 It is based on paddling the Malin Gometra for over 340 km in a wide variety of waters off the west coast of Scotland: the Solway, the Clyde, north and south of Ardnamurchan and the Inner Hebrides. 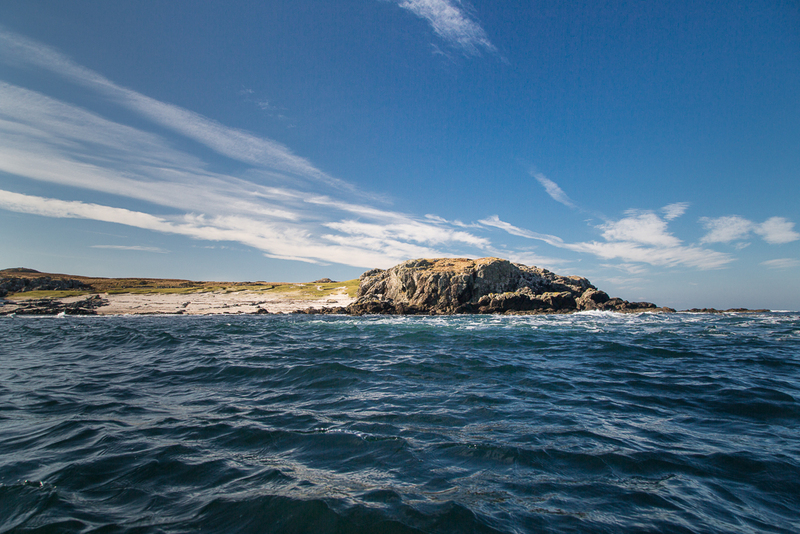 It has been used on open crossings and on exposed coasts and headlands. 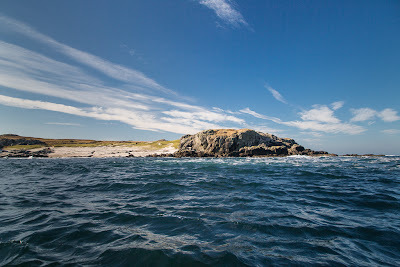 It has been tested in winds from force 0 to 5, in flat water, windblown chop, tide races moving at up to 12km/hour and in swell and surf on exposed Atlantic coasts and beaches. It has been paddled by six other paddlers weighing from 60 to 94kg, varying between novice and 5* level. The main tester is 1.73m tall, weighs 85kg and has paddled about 18,000 km since 2002. The Malin Gometra was paddled alongside and compared with a number of other popular "all round" sea kayaks including P&H Cetus MV, Cetus HV, Quest, Quest LV, Rockpool Alaw Bach, Tiderace Xcite and Valley Nordkapp LV. The majority of paddling was winter day paddling but the Gometra was also used for a 4 day camping trip. 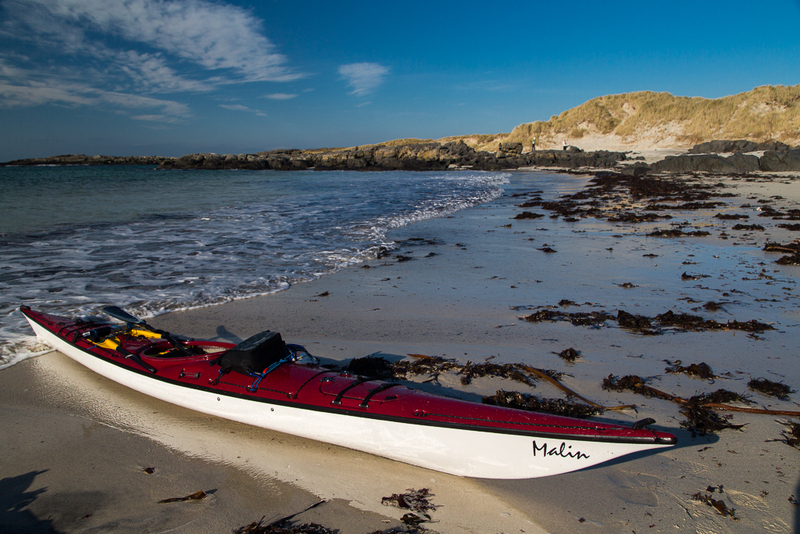 The Malin Gometra sea kayak - a great expedition sea touring kayak with a huge carrying capacity, which responds equally as well when used as a day kayak . 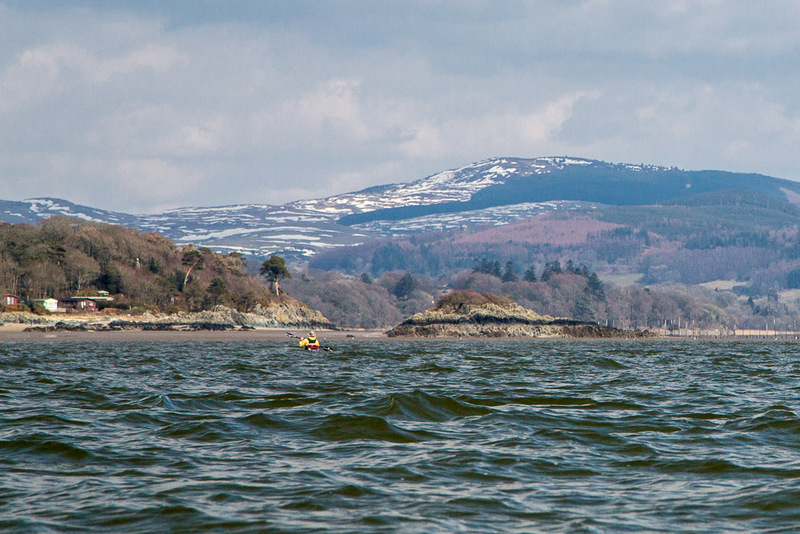 Being shorter than its bigger brother, the Ulva it is much more manoeuvrable. 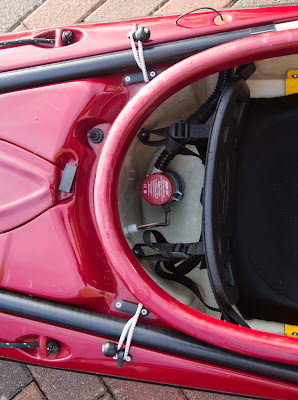 The large hinged hatches make it so easy to pack and unpack the kayak. 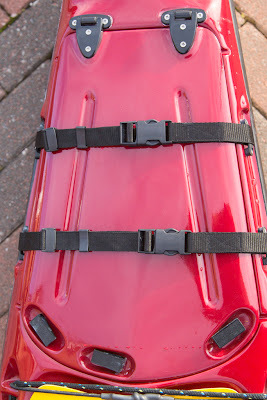 This kayak is very easy to roll whilst still being extremely stable. You can't help but be impressed by the beautiful lines of the Gometra. Have a paddle in it. You will not be disappointed. I first saw the Malin Gometra at the Perth canoe show in 2012. I was very impressed by the finish and original features in the design. The first thing I noticed about the profile of the Gometra was its beautiful sweeping "S" curves at the bow and stern. 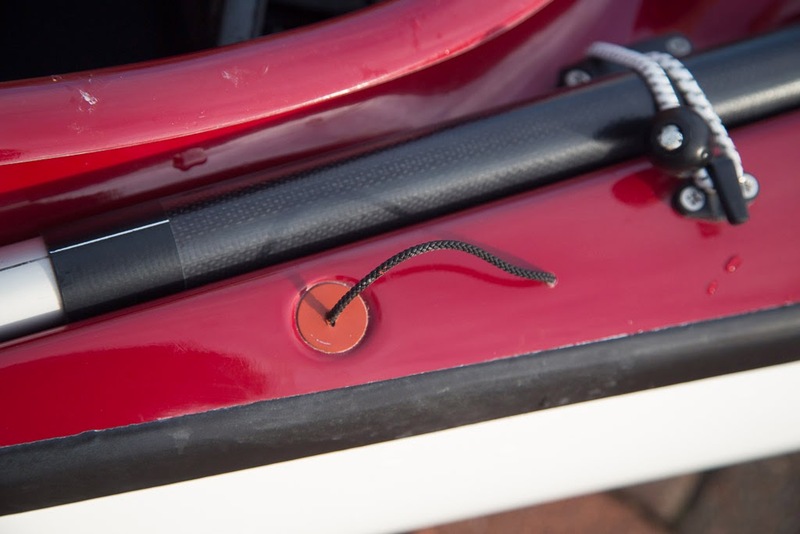 These allow a very natural handhold, which makes carrying a loaded kayak much easier. 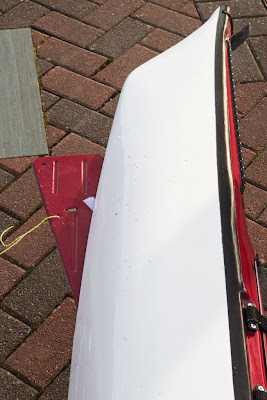 The second thing I noticed was an almost straight rocker line throughout a significant proportion of the keel. I assumed correctly that this would give great tracking but assumed wrongly that this would limit turning ability. In plan view, the wide point is just in front of the paddlers hips. The under hull has a shallow V leading into soft chines, which wash out into increasingly rounded sections towards the bow and stern. The deck has a very clean look due to the colour matched, flush GRP hatch covers. The Gometra is a relatively short 518cm but due to the long, straight rocker its waterline length is similar to longer, more rockered kayaks. This makes it faster than its length might suggest. At 56cm wide, it is the same width as the Quest/Quest LV but 3cm wider than the Alaw Bach, Xcite and Nordkapp LV. The Gometra has a forward main hatch and a forward day hatch but there is only one large rear hatch, though it has two hatch covers for ease of access. Although Malin sea kayaks have been building sea kayaks for over 35 years they are not mass produced. Each is individually built by Mike Donald and his perfection and attention to detail show. The construction was faultless and the demo Gometra looked particularly well in its white hull with glossy maroon deck. The deck is actually made in three parts and the sections are near invisibly joined at the edges of the main forward and rear hatch covers. The purpose of this is to allow access to the bow and stern during manufacture to ensure that the inside seam is wetted out and fully inserted right into the bow and stern. Only then is the central part of the deck assembled into place. 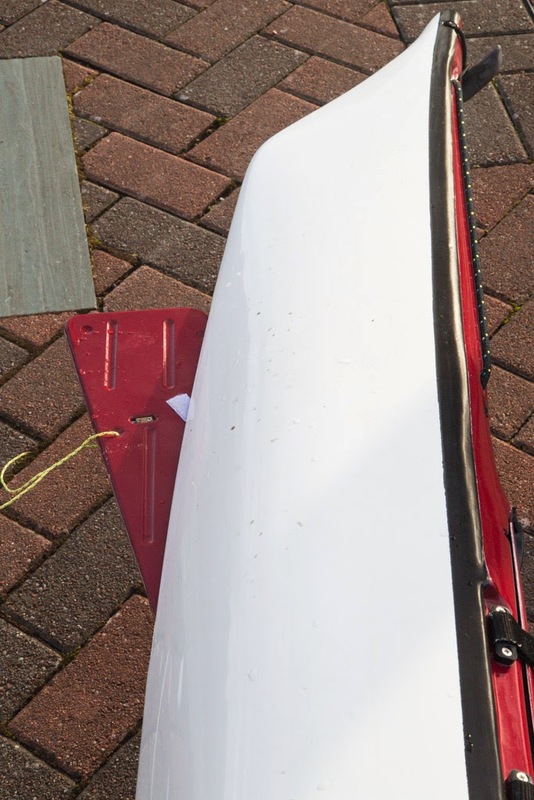 Inside seam problems at the bow and stern have been problematic in a significant number of European and Far East mass produced kayaks. The novel hatch covers are moulded GRP and are hinged at one end. They sit on rubber gaskets and are secured, opposite the hinges, by folding levers which operate rubber swell latches. 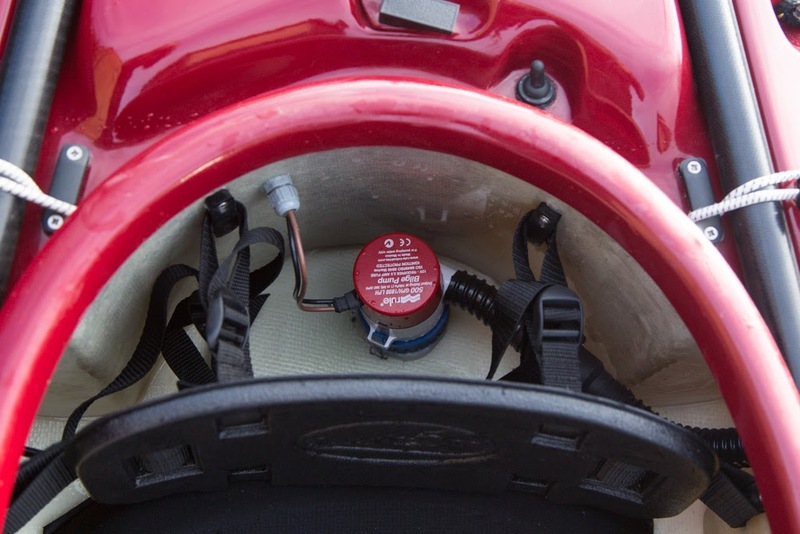 These are backed up on the two main hatches by twin adjustable straps with buckles. The hatch covers proved very easy to open and close even in icy conditions (unlike the Valley hatch covers, which are notoriously awkward). 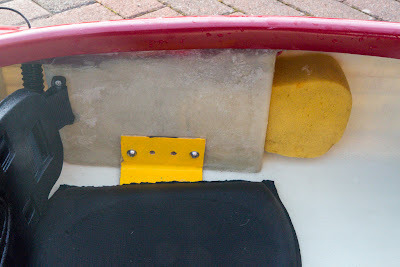 Despite being used in a variety of places, with sand grains from coarse to fine, the hatches remained totally waterproof even after extended rolling sessions. Being flush, the covers don't send up spray when waves are breaking along the deck. The electric pump battery box is accessed through the central rear day hatch. Looking forward from the main rear hatch towards the rear day hatch. The single large rear compartment, with two hatches, proved very space efficient and easy to load. 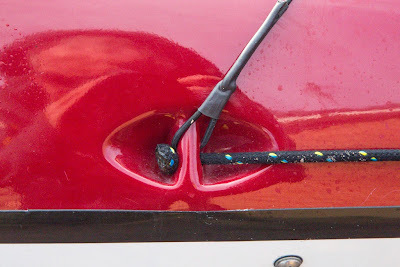 However, the central rear day hatch does give access to the whole space and so care should be taken opening it if conditions on the water are rough. 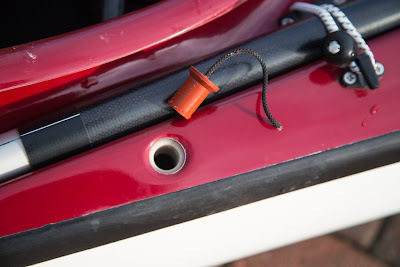 Some may argue a three bulkhead design is safer if a kayak gets holed but this does not concern me as I always use buoyancy bags, if I am paddling unloaded. The deck lines are larger diameter than most other manufacturers' lines and are easy to hold. They are retained by very neat colour matched, moulded in, deck fittings. The standard deck elastics were too thin and map case and pump were washed out by surf. You can specify thicker elastics. There are deck recesses behind the cockpit to fit the spare paddle blades while the shafts run forward in recesses on either side of the cockpit. This keeps the splits really flush yet readily to hand. They do not block access to either of the rear hatches. The deck recesses are designed specifically for these splits. The paddles are more than adequate for emergency use, having carbon shafts and GRP blades. At first I was doubtful about this arrangement but by the end of the test I was even leaving them stowed on deck while the kayak was on the car roof rack. The convenience of always having the spare paddles to hand but never finding them in the way made me really appreciate this original design feature. There is no moulded recess for a compass on the fore deck but there are moulded flats for towing fairlead and cleat on the rear deck. 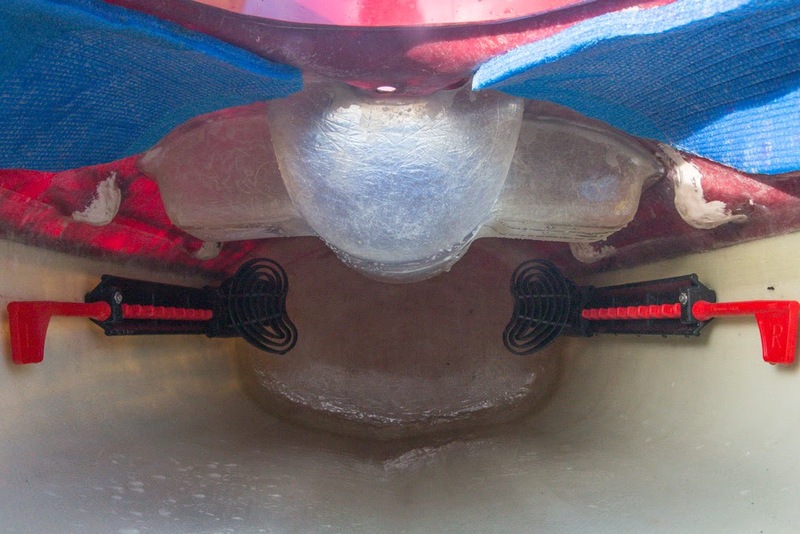 The Gometra has a very large, stiff and effective skeg, which is easily operated by a non kink wire system. 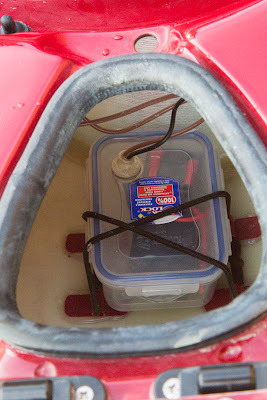 The tube that the skeg wire runs in has an ingenious T piece inside the cockpit, which allows silicone lubricant to be sprayed in without disassembling the skeg system. The rear bulkhead is curved to make room for water bags behind the seat and the demo boat had a very neatly installed electric pump here. There is a recess in the deck behind the cockpit that protects the rubber covered pump switch. The pump proved highly effective. The very neat pump outlet plug is typical of the attention to detail by Malin kayaks. It means there is no need for a one way valve which would reduce pump output. The demo boat was supplied with Sea-Lect Designs plastic footrests with easily adjustable wands but many Malin customers choose a custom bulkhead. The foam seat sits on a yellow GRP hanger which can be moved forward or back on the vertical cockpit sides. We were not aware of this feature during testing and some of the longer legged paddlers wished they could have moved the seat back. 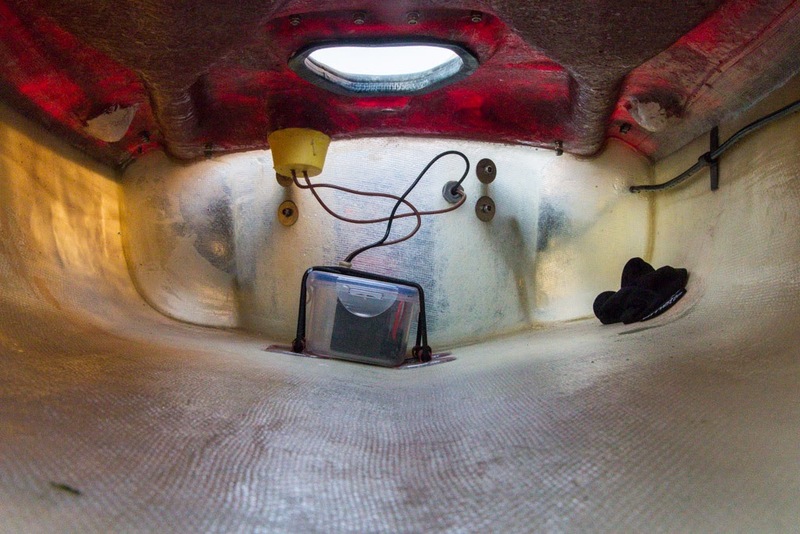 There is space between the cockpit sides and the hull for storing sponges etc. On the demo boat the seat hanger was rather narrow (fore and aft) and our bum could feel the edge through the thin part of the foam seat. 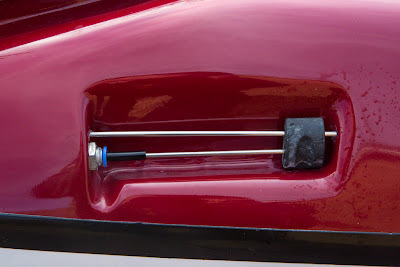 We cured it by putting a little sleeping mat foam under the seat but Malin have since widened the hanger. Our three biggest paddlers had to remove the supplied hip pads to fit in while wearing full winter gear. 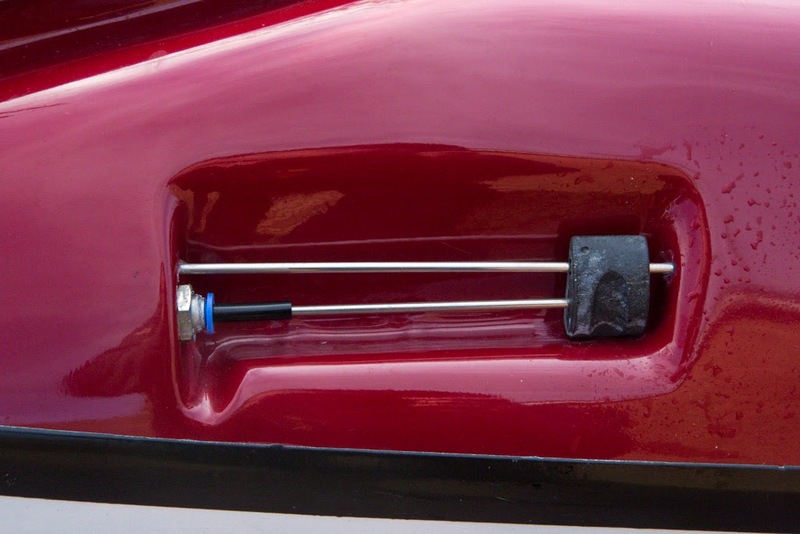 There is a large knee tube under the forward day hatch. 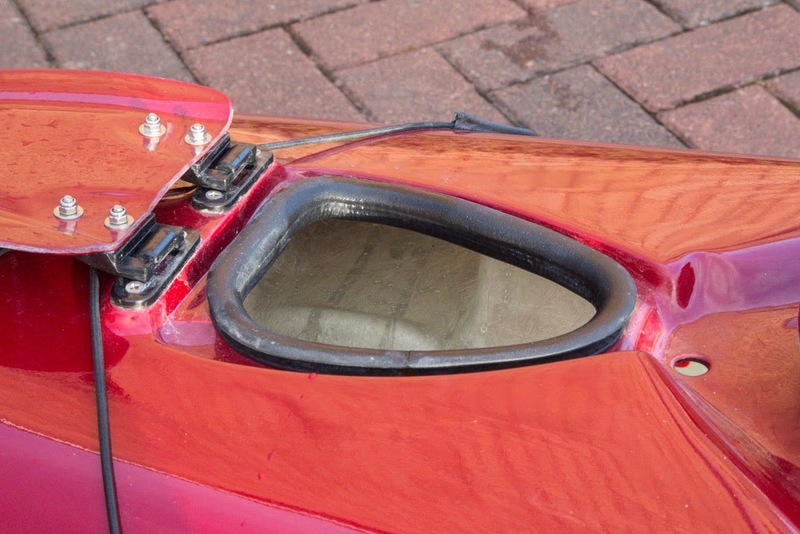 This extends at the back to either side in a T shape and makes the forward day hatch very commodious and useful. 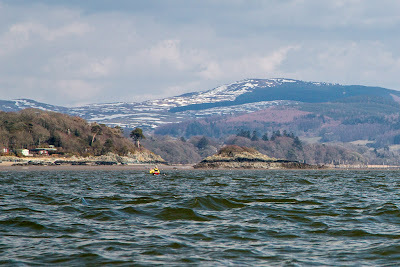 However, two of our larger footed paddlers found their toes hit the top of the T when they were jumping in quickly during surf launches. Malin are aware of this and, should you have particularly large feet, they can make the forward day hatch a simple longitudinal tube. The underside of the cockpit coaming was padded and the larger paddlers felt it very comfortable. Smaller thinner paddlers might need a little more padding but all sizes of our paddlers were pleased with an ergonomic seating position that allowed a comfortable bracing position when required and a more relaxed position when cruising. The standout feature of the Gometra's performance was its seaworthiness, especially in rough conditions. 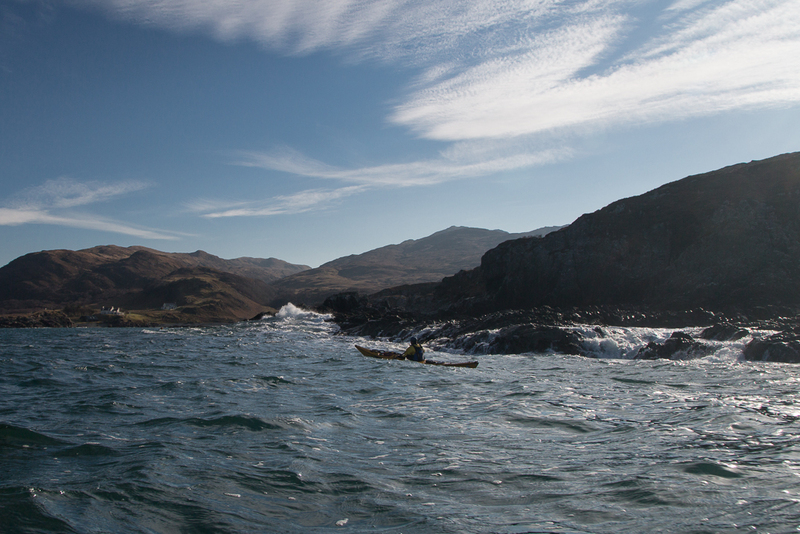 It performed particularly well when paddling downwind in following breaking seas. Despite its load carrying ability and lack of rocker, it proved to be highly manoeuvrable and equally as good as a day boat. 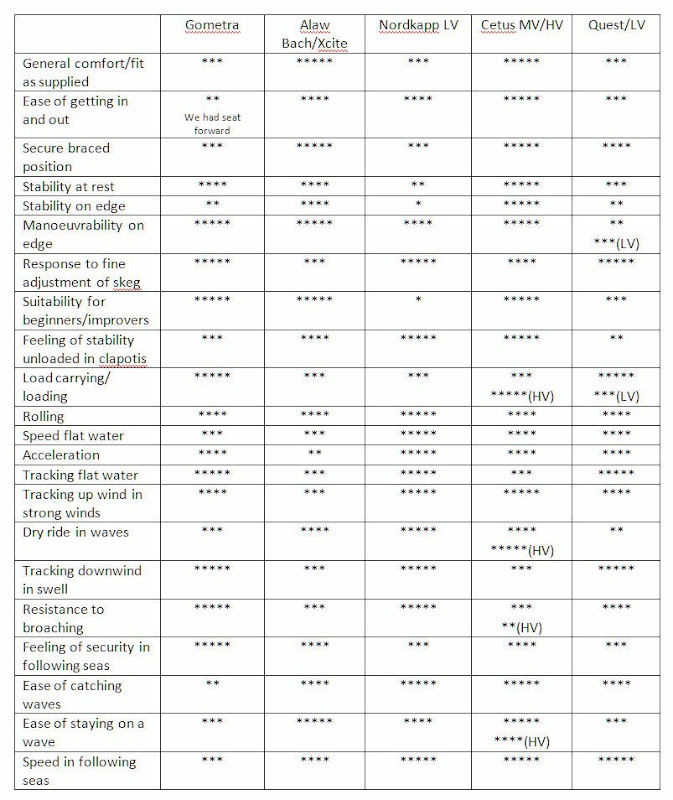 Please refer to the table for a detailed comparison of the Gometra with some other kayaks of differing designs but similar intended all round use. Best performance is *****. 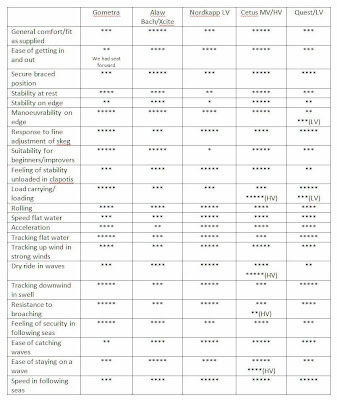 It is not intended that stars be added as some of the performance features, which we compared, are more important than others and different people will rate the same feature more or less importantly, depending on their experience and paddling style. 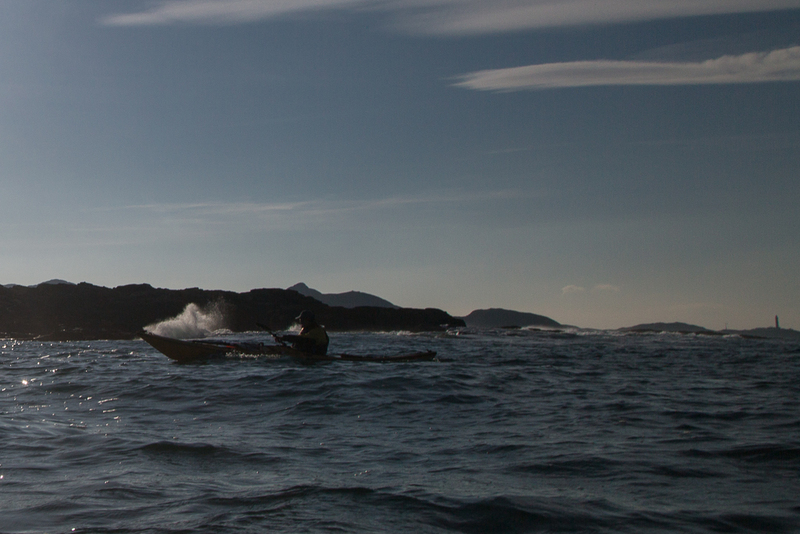 It was a real joy to use and paddle the Malin Gometra. This is not a kayak designed by a committee. It is a design that has evolved through 35 years of development of one man's vision. As such, it has some unique and highly practical features. In essence it is a short, manoeuvrable kayak with a remarkable load carrying ability that can accommodate a wide range of paddler sizes. I was particularly impressed by its seaworthiness in testing "big" conditions. Lastly, in these days when almost everything we buy needs to be mass produced in the Far East to meet our expectations of quality and price, it was a real pleasure to be able to talk to the designer about what could be customised for a purchaser and to paddle a kayak built in the UK. Weight (standard construction, adjustable footrests, electric pump and battery, no keel strip, no compass): 24.5kg, length: 518cm, width: 56 cm, cockpit length: 81cm, breadth: 41.5cm, internal height at front of cockpit: 33cm, rear of seat base to front of cockpit: 61cm (as supplied but seat can adjust backwards).